“Sirikot” means “village at the top” or “hill-top village”, because “siri” means “top” and “kot” means “village”. The name is a reference to its mountainous physical geography. Shaheed Gali is situated at the height of 1640 meters above sea level at a distance of about 16 kilometers westward from Muzaffarabad. From Shaheed Gali a trek of 4 Kms leads towards a spot namely “Sri Kot”. A tourist is bound to be fascinated by the serenity for the backdrop of the area. A tourist Rest House is available for accommodation at Shaheed Gali. 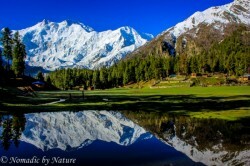 I visited your website to know the trekking options in muzaffarabad and neelum valley for three days trek n travel tour. But I found only one option ” Shaheed Gali, sri kot” trek option. Could you please mention more options in that area, as this area has variety of all types of land scrap so it must have numerous trekking options. Please suggest me some more through my email, or directly update your web link of trekking.